This may a bit heavy for Monday, but maybe it is a useful disruption of work to consider something more important: life. Prologue: My mother died of cancer at 47 years of age. I was 18 years old. Her death was not sudden, so we had a long time to talk and get used to the idea. In the end, her death relieved her from the pain. She was one of the wisest people I know, and a lot of that wisdom came from the introspection she went through as she fought for life and approached death. I was holding her hand when she died. I told her "it's okay to die now," and she stopped breathing. This point is important because we all face death at some time. Acceptance makes it easier for you as well as those around you. I often think of my death (or absence), and it bothers me in terms of interrupting my plans or enjoyment of life. OTOH, it's going to happen so it hardly seems worth fearing. I think you may want to read this. David, that essay is so wonderfully thoughtful and well-written, thank you for sending the link! But the reality is that even though I have “well-being” – I smile often, I am happy, I do as much as I am physically able – my body is not well. The decision not to have chemo was made exactly so that I could have a few months of well-being – and that is the experience I am having. But people misinterpret “well-being” as evidence that the cancer has gone away. It hasn’t. After the surgery in January the doctors estimated my life expectancy, without chemo, at less than 6 months. Now here we are in the 3rd week of May. Based on what I feel happening in my abdomen it seems like the doctors’ estimate may still be accurate – time may be very short for me now. That thought does not fill me with dread, or fear, or depression. There are very, very few people who can really ‘hear’ me say where I am at with all of this now. I made the decision not to go through a long, slow, uncomfortable decline to death. I have no interest in revisiting that decision. Last Saturday a friend invited me to go to the “Rejuvenation Festival” at the park down by the river. On the spur of the moment I said yes. There were reggae bands playing, and we kicked off our shoes and danced barefoot on the grass until I was too tired to dance any more. The muscles in my legs were sore all the next day. It was worth it. (smile) I am enjoying being alive. Thank you for sending that email, David, it is very timely. Today, June 23, is my 61st birthday. For most of the past six months I did not know if I would live to see this birthday. Things could change at any time, but for today – I feel well enough to celebrate! Every year is a miracle, especially when you consider how we complicate our enjoyments. Even now I receive emails from people saying Don’t give up! You can fight this! Miracles do happen! 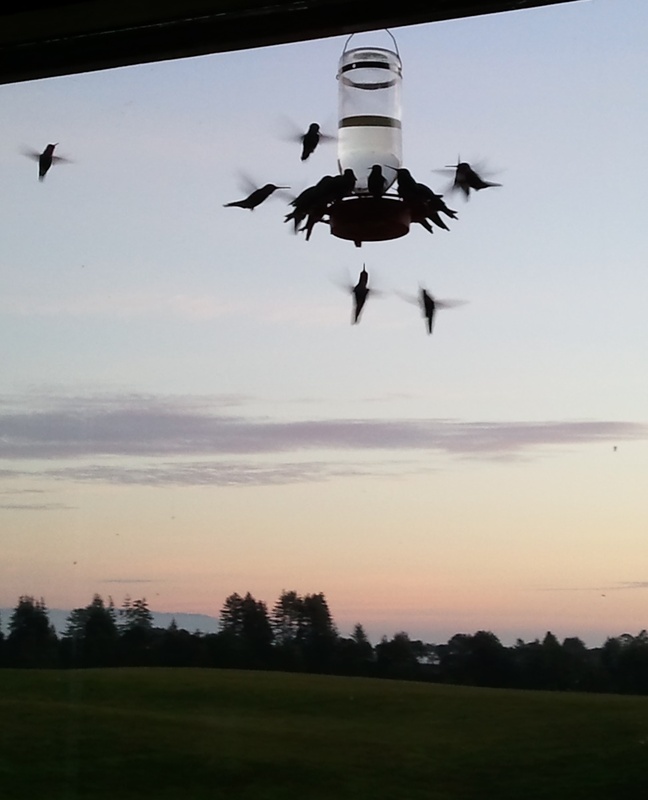 Connie remarked at the cooperation of these "masses"
of hummingbirds outside her Santa Cruz window. Connie started a blog (tagline: "A belief is nothing more than the result of a decision to stop asking questions") just before she found out about her cancer, as a means of preserving the dialogue on depression that she was having with a young hacker (Aaron Swartz killed himself around the same time). That blog turned into an archive of her thoughts on life, cancer, community and death. It also has an amazing post on her 40-year battle with depression -- a battle that she eventually won (AFAIK). My mother was not exactly depressed in her life, but her other four sisters often said she attracted bad luck. Although my memory of our times together have faded, I do think that she ended up enjoying herself more often (I remember her saying "well, I like pesto so I'm going to eat it from the jar" and "what's the point of having best dishes if you don't use them?"). I know that she did not want to die, but I also know that she made the best of what time she had, even with the pain and bickering (everyone has an opinion). Honestly, I think a major reason why my quality of life is so good even now is because I DO NOT TAKE DRUGS. My healthcare team is once again repeatedly suggesting that I take morphine. I’ll take morphine when I have reached the point where all I want to do is curl up on the bed with my mind lost in a confused daze. Because that was my experience of being on morphine when I was in the hospital. And I’ll add – a hospice worker implored me not to write about this on my blog because it might ‘discourage people from taking morphine when they really need it’. Here is one way to figure out if a hospice patient might ‘really need’ morphine: Ask them if they think they need it. So then I check in with myself and say, “Self, do you think you should be taking morphine?” So far the answer keeps coming back, No. And it actually creates tension with my healthcare team which is unfortunate. Sometimes in quiet moments I contemplate the reality that death might be quite near now. And when I think about how it all fits with the trajectory of my entire life, and the naturalness of death as a part of life – I am flooded with a deep sense of peace, of stillness, of gratitude. It is the outcome of years spent learning how my mind works, and how to explore and question my own thoughts, and how to identify when Ego has taken control with its fears and incessant chatter, and how to go beyond all of that to find the inner wellspring of peace. That peacefulness is so far beyond any experience that any drug could provide, I cannot even explain it in words. May she rest in peace... and her example remind us of where peace resides.